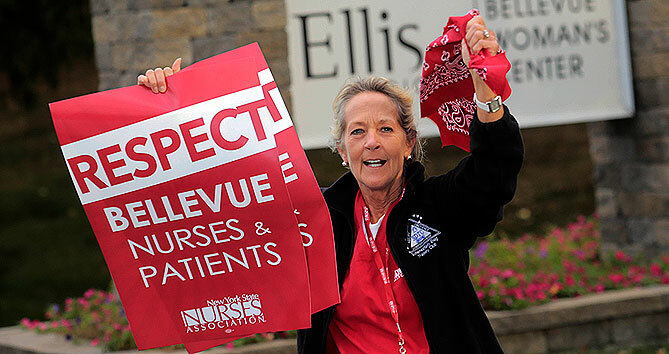 Hundreds of Capital Region NYSNA nurses rallied Wednesday in our communities for fair contracts that protect patient care at our first-ever, multi-facility picket at Ellis Medicine and Bellevue Woman’s Center in Schenectady, and Nathan Littauer Hospital in Gloversville. Contract talks have been stalled at these facilities as hospital administrators, who won't accept our proposals that include important patient care protections like safe staffing guidelines and our platform to keep and attract nurses to care for patients, refuse to do what’s right for patient care. We kicked off the rally on Wednesday afternoon at Ellis Hospital in Schenectady and at Nathan Littauer in Gloversville, an hour away. We packed the sidewalk in front of Ellis, as nurses marched with patients, politicians (and babies AND puppies!) and a long list of labor friends, including Schenectady AFL-CIO, NYSUT, Plumbers and Pipefitters, AFM (Musicians Union) 1199SEIU and the Ironworkers. Assemblymember Phil Steck and Democratic candidate for State Senate Madelyn Thorne took a break from their busy campaign schedules to join us on the picket line. NYSNA Nurses at Nathan Littauer Hospital. Ellis Hospital RN and Central Regional Director of NYSNA, Carol Ann Lemon told multiple reporters that negotiations with the hospital have been frustrating due to management’s refusal to even discuss implementing safe staffing ratios at Ellis Hospital. “They don’t acknowledge that there is a staffing problem, and they believe that they should be able to dictate staffing to suit their needs. This negatively affects everything about patient care,” said Lemon. 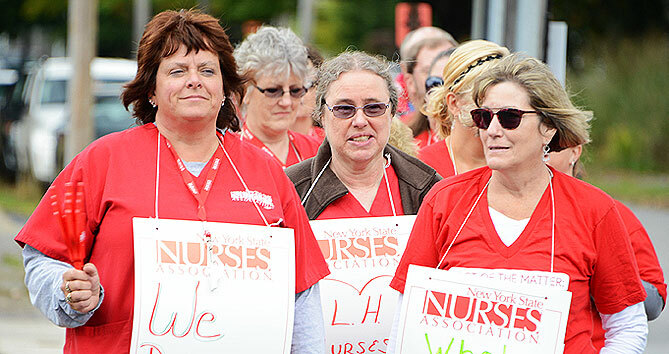 Our bargaining units represent more than 800 nurses between the three Capital Region facilities and our contract negotiations have been dragging on for months, and even years, in the case of Nathan Littauer Hospital, where RNs there marched in a lively picket line to a drum beat and patient care chants. Our issues are the same - we need better nurse staffing levels and the guidelines to protect them in our contracts. We ended our historic 3-facility community picket in front of Bellevue Woman’s Center, across town from Ellis Hospital, on busy Route 7 in Schenectady. Bellevue is known in the Capital Region as the premier place to have a baby, but a new model of care is threatening that one-to-one attention. “Nurses are often pulled away from mothers and babies to assist on other units, leaving just one nurse caring for 5-7 babies at once. This is not the level of care that our mothers and families expect,” said Jen Gunderman, a registered nurse at Bellevue Woman’s Center who has worked for the NICU for 19 years. NYSNA Nurses at Bellevue Woman’s Center. Nurses at all three facilities are back to the bargaining table later this month and we will continue to let Capital Region patients know that we're united for their care. We made headlines! Check out our Capital Region press coverage from the picket!